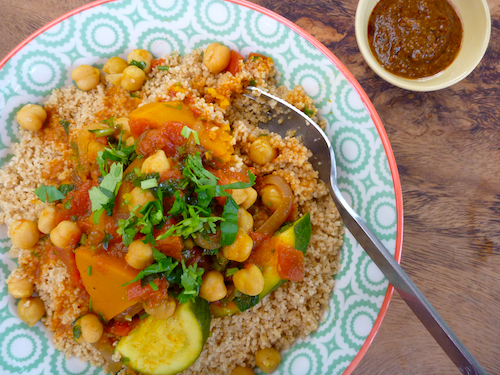 In the 1990s, Australians first discovered Moroccan food and it became one of the defining foods fads of the decade. Many of my friends purchased couscousieres, which eventually became like the fondue sets of the 1970s – relegated to the backs of cupboards or sold off in garage sales. Moroccan food has come back into its own recently but its never reached the heady heights of our 1990s infatuation. 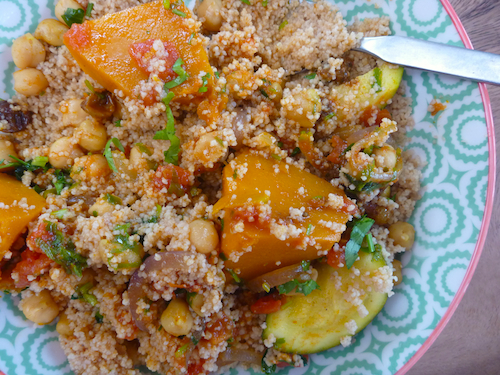 I’ve been making some kind of version of this chickpea and pumpkin cous cous stew since the ’90s and it’s always reliable. It’s something you can whip up when you’re in the middle of nowhere from ingredients gleaned from a country supermarket. It’s always good to have a few quick and easy vegetarian dishes, with readily accessible ingredients when you’re traveling off the beaten track. It also makes a great campfire meal. 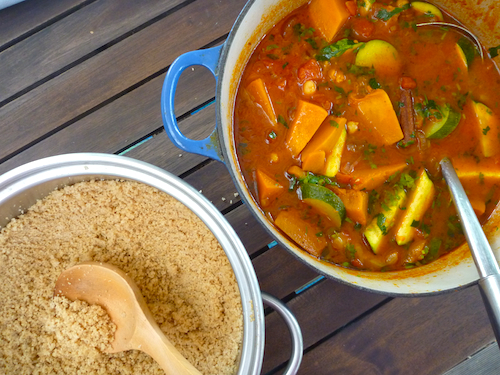 Cous cous is a much easier grain to cook on the camp stove or fire, particularly compared to rice, which can be a bit tricky. It’s also vegan, although I always tend to serve it with the option of yoghurt on the side and with a salad in the summer or sauteed greens in the winter. I worked in a middle-Eastern cafe in the ’90s and we always served the cous cous with a swirl of tarator (tahini sauce) swirled through the stew and that makes a really delicious vegan alternative to the yoghurt. This simple chickpea stew makes a great mid-week meal but, dressed up with a few sides, it can make a dinner-party-worthy meal in itself. I fell a little bit out of love with cous cous when I realised it was really just a highly refined grain like pasta, but I then discovered wholemeal cous cous (now widely available), which I prefer because of the nutty taste anyway. If you are cooking for kids, I’d also advise to leave the raisins out, unless you’re okay with them picking them out and depositing them on your plate. The other good thing about this stew, if you’re suffering chilli deprivation from cooking for kids, you can add the harissa or hot sauce at the table so you can get a burst of heat without burning your children’s mouths out. If you don’t have any harissa on hand, any chilli puree such as sambal oelek or Trinidadian pepper sauce will work well. Harissa or any pureed hot sauce, thinned out with a little bit of liquid from the stew. Combine ground spices ginger, cumin, paprika, tumeric and cayenne in small bowl and set aside. Heat oil in heavy pan or Dutch oven. When oil is hot, throw in the cinnamon stick and let it sizzle, then add onion. Saute onion for about three minutes until medium brown. Now add ground spices. Stir through onion and quickly add tomato. Stir and cook for about five minutes until tomatoes have melted a little. Add chickpeas, pumpkin, raisins and stock and bring to a gentle simmer. Cover and cook gently on low for about 13–15 minutes until the pumpkin is just tender. Add zucchini or broad beans or green beans and simmer uncovered for another five minutes, stirring occasionally until all the vegetables are tender. Add coriander and parsley just before serving. To serve, put a pile of cous cous in each plate. Make a well in the centre with a slotted spoon, arrange some vegetables and chickpeas on cous cous and then generously dampen the cous cous with some of the sauce from the stew. Serve with hot sauce on side to stir through. Narf the vegan from Tasmania has perused this recipe and has found it to be good…VERY good. Cheers ma’am. I shall be making this post haste. It’s just thing to celebrate the coming autumn coolness down in Tassie. Wow! This looks awesome! I cannot wait to try your recipe. Thank you for sharing it! 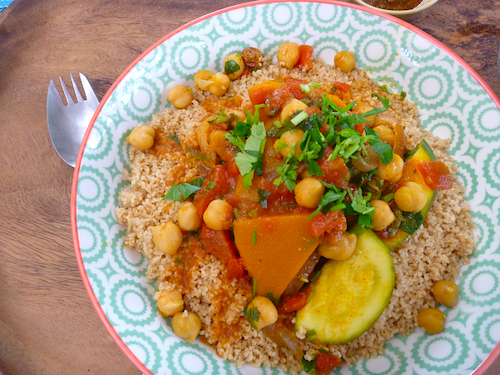 Looks awesome, I really do love moroccan flavours!